FTSE 250 forecasts are pretty thin on the ground, despite it being something I get asked to do quite frequently. To fix that, I’m going to start a quarterly series of valuations and forecasts for the mid-cap index. The CAPE ratio is a much better option for valuing indices than the standard PE ratio or dividend yield (although the dividend yield can still be quite useful). CAPE compares the current price against the 10-year inflation adjusted average earnings, which provides a nice smooth, stable platform against which to compare the price. The 10 years of earnings data I’ve used to calculate the FTSE 250’s CAPE ratio is “good enough”, I think, but not exactly perfect. The FT website has official data going back to about 2009, so the first 7 years or so are spot on. However, earlier data is not freely available, or not that I could find. So in the absence of official data I found a chart of FTSE 250 earnings data going back to 1993 in this PDF and extracted the earnings figures from the chart. That compares to a CAPE ratio for the FTSE 100 of 12.8, with the large-cap index at 6,775, so on the face of it the FTSE 250 appears to be almost twice as “expensive” as the FTSE 100. However, whether or not an index is cheap or expensive depends not only on how its CAPE ratio compares to other indices, but more importantly to its own historic average. That’s because CAPE is expected to be “mean reverting”, which means that eventually we can expect the CAPE ratio to get back at its long-term average or “normal” value. Using data from the FT website and the earnings chart above I have estimated an average CAPE ratio going back to 1993. Note: I say “estimated” because the individual CAPE values towards the beginning of that period are themselves estimates because I don’t have sufficient accurate earnings data. However, an estimate should be good enough as CAPE is all about long-term averages and trends, not accuracy to the third decimal place. That is quite a bit higher than the average of 18.7 for the FTSE 100 over the same period. However, I think that average is likely to be higher than the “true” long-term average, i.e. the average based on perhaps a century of data, if that data were available. I think the true average is probably lower because the last decade or so has included both the dot-com bubble and the pre-financial crisis property bubble, both of which produced relatively high CAPE valuations over a number of years, which has likely skewed the average CAPE for the whole period upwards. The data for the FTSE 100 has the same problem, so in that case I estimate that the “true” long-term average CAPE ratio is 16 (below the actual average of 18.7), which is approximately the same as the ratio for the S&P 500, where more than a century of accurate data is available. The chart below is a visualisation of how likely a particular CAPE ratio is at any point in time, and is based on the Bank of England’s somewhat famous “fan chart” approach. Darker greens – are the more likely or “normal” valuation ranges, i.e. those that are closer to the average of 20. 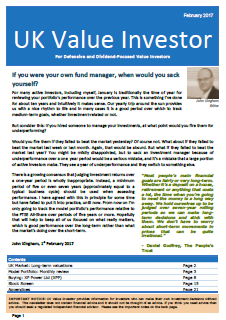 Lighter greens – are the less likely and “extreme” valuation levels that the index rarely reaches. This is the domain of bubbles and depressions. 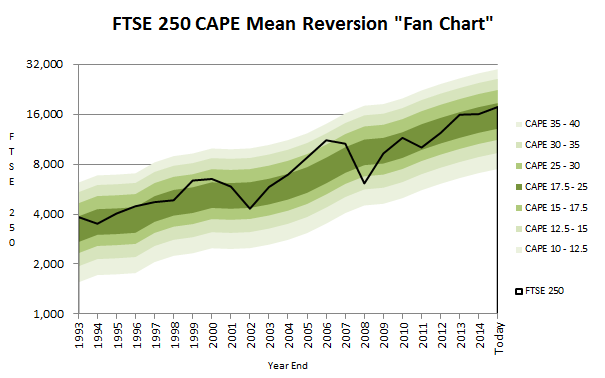 So for example you can see that in the dot-com bubble (1999 to 2000) the FTSE 250 moved above the darkest green “normal” band (CAPE between 17.5 and 25) into the “slightly expensive” lighter green band (CAPE between 25 and 30). During the pre-financial crisis period (2005 to 2007) it became even more expensive, moving up higher into the “expensive” band (CAPE between 30 and 35) and almost into the very highest “very expensive” band (CAPE between 35 and 40). Another way to look as current and past CAPE ratios is to focus on their implications for future returns rather than their distance above or below the long-term average. 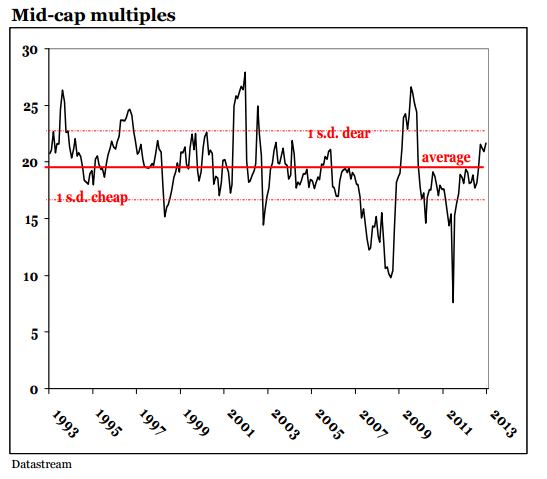 High CAPE ratios typically lead to lower medium-term returns as the ratio reverts back towards the average over a period of several years. This occurs either because the index fails to keep up with earnings growth or because its falls in value. For low CAPE ratios the situation is reversed, implying above average future returns. 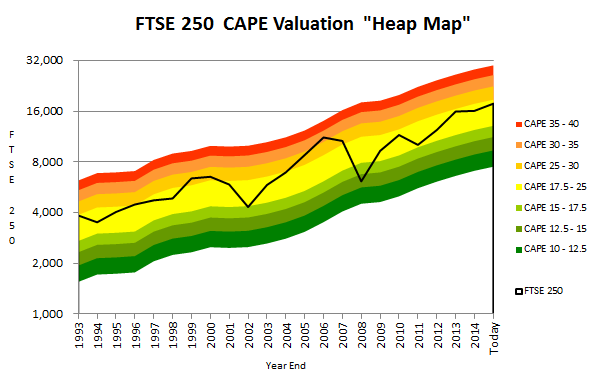 Hopefully this chart shows clearly how the FTSE 250’s current CAPE ratio of 23.7 falls into the “normal” central yellow band, slightly above my estimate of its long-term average of 20. Thanks John. A very interesting post. You know what would be a good plot: percentile valuation against time, rather than index value against time. It would lead to a much more natural interpretation than the bands. HI Mark, that’s an interesting idea. It could be a useful addition, but I like my valuation bands so I’m going to stick with them as my core valuation graphic. However, if a percentile chart makes sense I’ll think about putting one in next time around. Very interesting, thanks for publishing it. 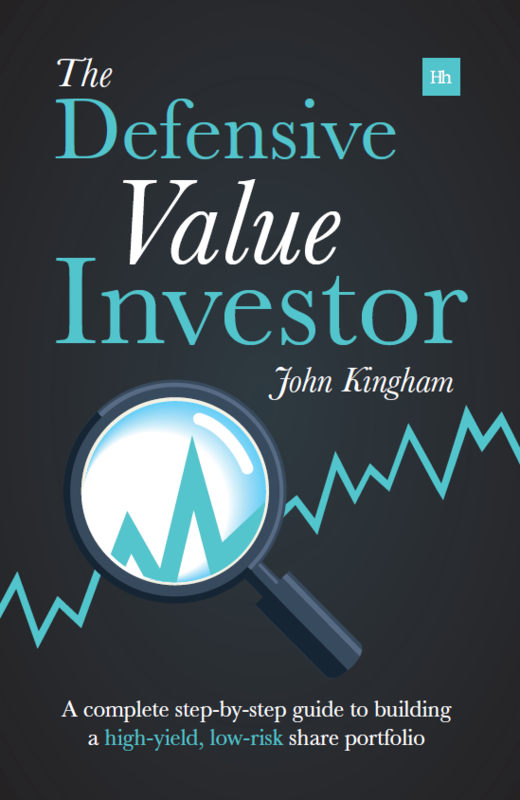 Do you have any reliable data for the dividend yeild CAGR for the FTSE 250? I only have “reliable” data going back as far as the FT data, which is less than 10 years. For earlier data I currently only have the cart in the article, but I will probably have another look and see if there is anything online. 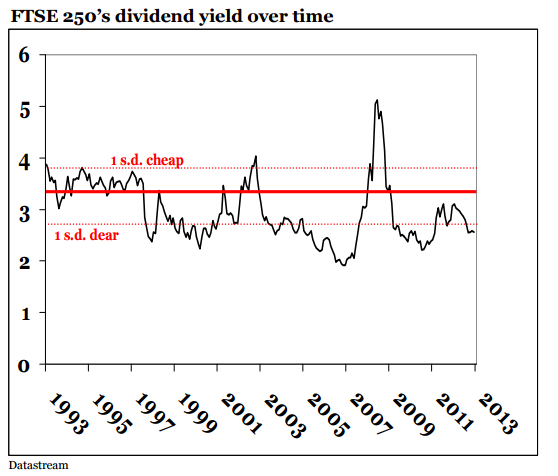 For the data I have, the FTSE 250’s median annual dividend growth rate is 5.9%, which is probably about right for the longer-term growth rate too. Thanks Bob, I agree, the FTSE 250 index doesn’t get enough attention or enough sensible analysis.